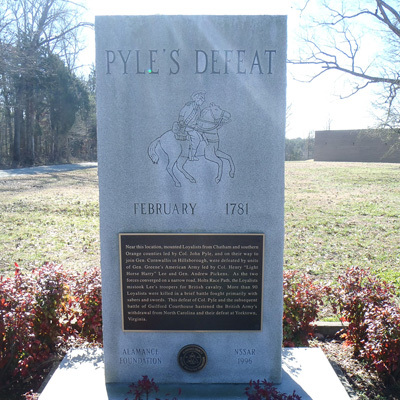 Description: This rectangular marble monument marks the site of Pyle's defeat. 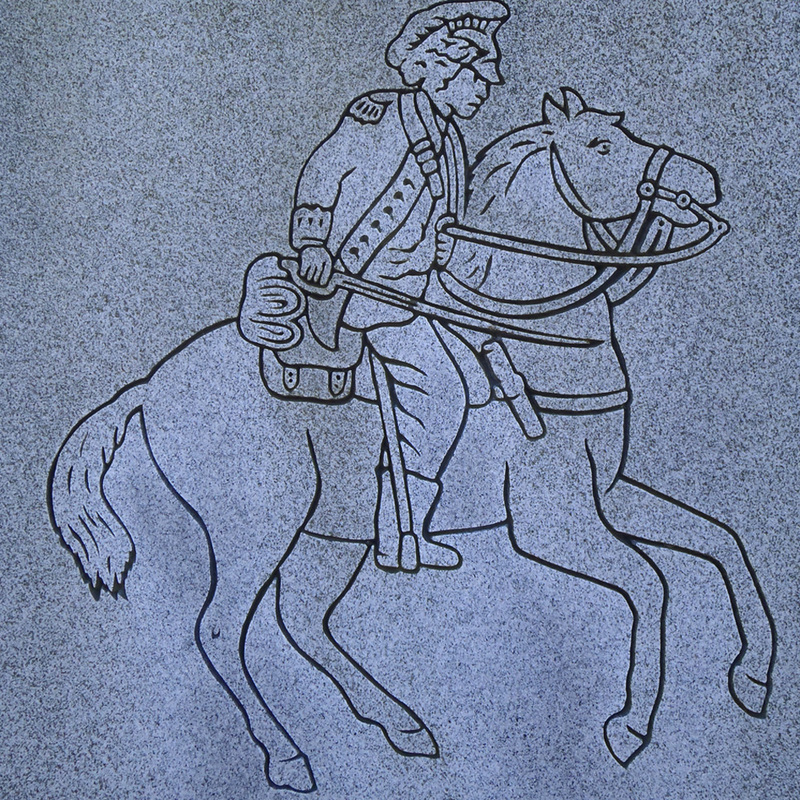 An image of Pyle, depicted on horseback, is carved into the marble. Below the carving are a bronze plaque and seal. 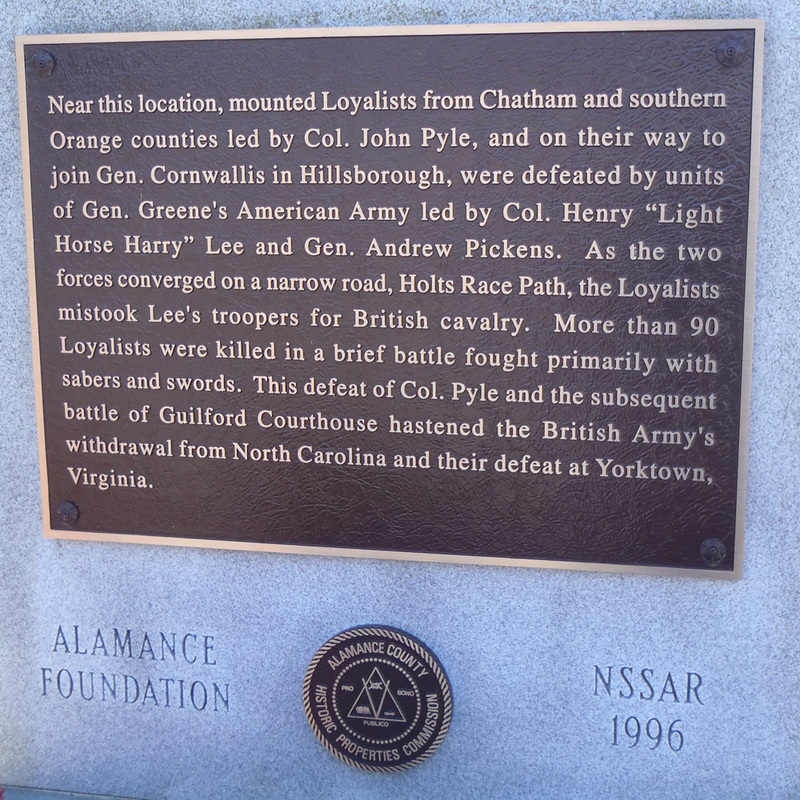 On the top part of the stone slab: "PYLE'S DEFEAT"
Below the engraving of a horse and its rider: "FEBRUARY 1781"
On the very bottom of the stone slab: "ALAMANCE/FOUNDERS, NSSAR/ 1996"
On front of bronze tablet: "NEAR THIS LOCATION, MOUNTED LOYALISTS FROM CAHTHAM AND SOUTHERN/ORANGE COUNTIES LED BY COL. JOHN PYLE, AND ON THEIR WAY TO/JOIN GEN. CORNWALLIS IN HILLSBOROUGH, WERE DEFEATED BY UNITS/OF GEN. GREENE'S AMERICAN ARMY LED BY COL. HENRY "LIGHT/HORSE HARRY" LEE AND GEN. ANDREW PICKENS. AS THE TWO/FORCES CONVERGED ON A NARROW ROAD, HOLTS RACE PATH, THE LOYALISTS/MISTOOK LEE'S TROOPERS FOR BRITISH CALVARLY. MORE THAN 90/LOYALISTS WERE KILLED IN A BRIEF BATTLE FOUGHT PRIMARILY WITH/SABERS AND SWORDS. THIS DEFEAT OF COL. PYLE AND THE SUBSEQUENT/BATTELE OF GUILFORD COURTHOUSE HASTENED THE BRITISH ARMY'S/ WITHDRAWAL FROM NORTH CAROLINA AND THEIR DEFEAT AT YORKTOWN, / VIRGINIA." Post dedication use: On May 13, 2006 the Battle of Alamance Chapter of the NSSAR held a 225th Anniversary of Pyle's Defeat, the Battle of Clapp's Mill, and the Battle of Lindley's Mill on Patriot's Day at the Alamance Battleground Historic Site. Every year there is a commemorative ceremony at Alamance Battlegrounds to honor the men who fought during Pyle's Defeat, Battle of Clapp's Mill, and Battle of Lindley's Mill on Patriots' Day (annual event on the third Monday of April). Subject notes: The battle was fought during the Revolutionary War on February 24, 1781. 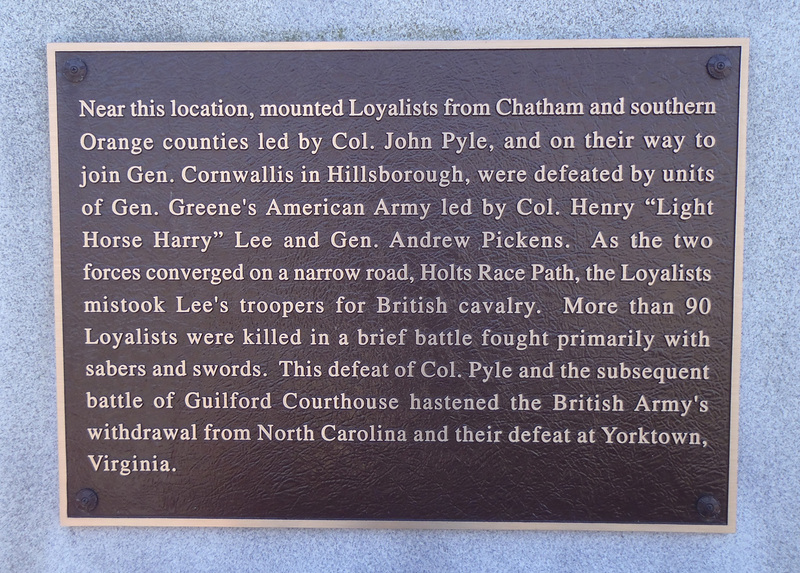 Loyalists under the command of Colonel John Pyle were trying to join General Cornwallis troops in Hillsborough. On the way, General Greene's troops under Colonel Henry Lee and General Andrew Pickens direct command merged and the Loyalists started shooting at Lee's forces. The short battle was fought against the American troops and the Loyalists and led to Colonel Pyle's loss. The highway marker was built before the actual landmark memorial was constructed. The road marker sign was created in 1967 by the Archives and Highway Department. Currently the memorial (built in 1996) location marks Holt's Race Path, where the battle between the Tories and units of General Greene's American Revolutionary Army took place. 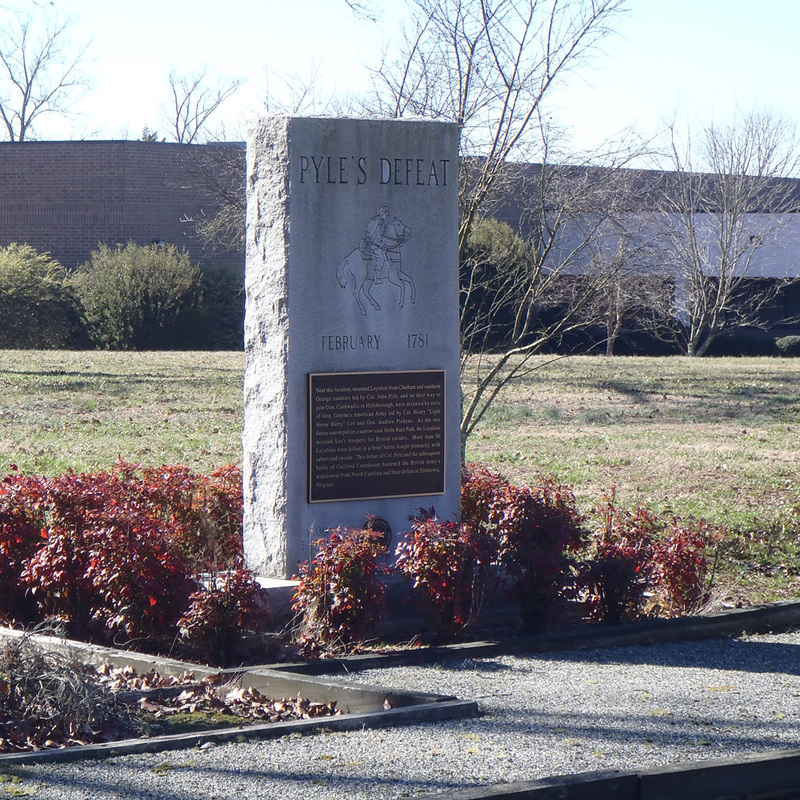 Location: The monument faces a stone path in a flat plain on the Pyle's Defeat Battle landmark area. 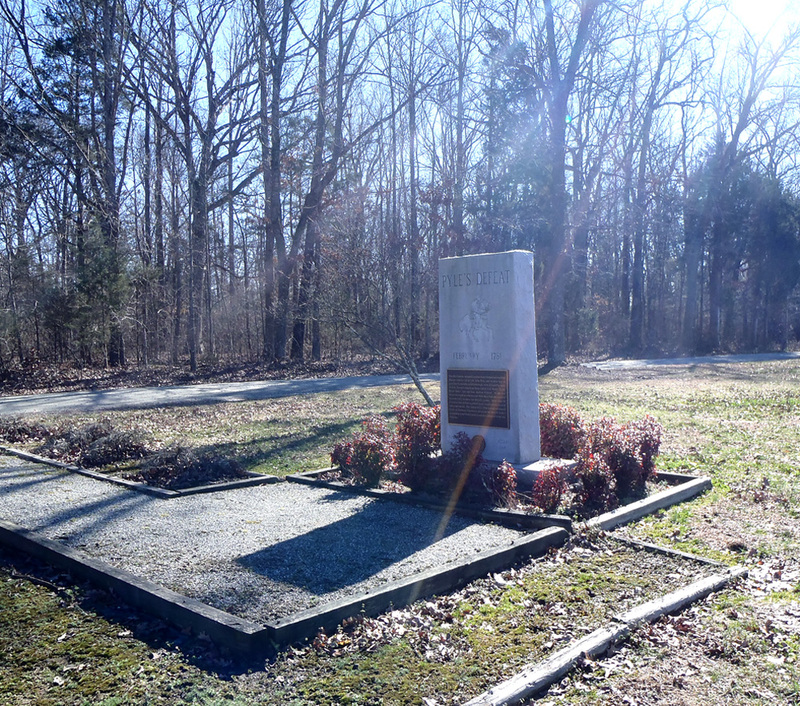 The monument is near the intersection of Anthony Road and Old Trail. It is located on grounds of Splawn Belting, Inc. and specifically behind the main building. Landscape: The monument is atop of a grassy plain with trees in the background. A concrete path is parallel to the monument and a stone path is directly located in front of the monument.